Twenty three years ago, Deb Roth never would have believed the changes in cutting edge ethanol technology she’s been able to be a part of. When Deb Roth was hired as POET’s lab tech – and one of its first employees – in 1988, her job required her to do a little bit of, well, everything. Now, 23 years later, Deb is one of the longest-tenured employees at POET. For Deb, the multitasking and on-the-job opportunities have made her career at POET seem shorter, she says, than two decades. Today, Deb is still recognized for her willingness to take on any job, all while keeping on the cutting edge of ethanol technology. The surroundings have grown–the Scotland plant now has 50-plus employees, and the original “closet-size” lab is now a state-of-the-art facility. Deb’s day-to-day responsibilities have also grown–she now serves as Research Lab Manager and oversees five lab technicians. But the traits that Broin recognized in Roth–a willingness to be a team player, a natural curiosity, and a strong work ethic–continue to drive Deb’s success at POET. Those traits were ingrained at a young age for Deb, who grew up as a “typical farm kid” on her family’s crop and cattle farm in Wagner, S.D. After high school, Deb “was determined to make enough money to attend college.” And she did, sometimes working two jobs as she earned a Biotech degree from the University of South Dakota. 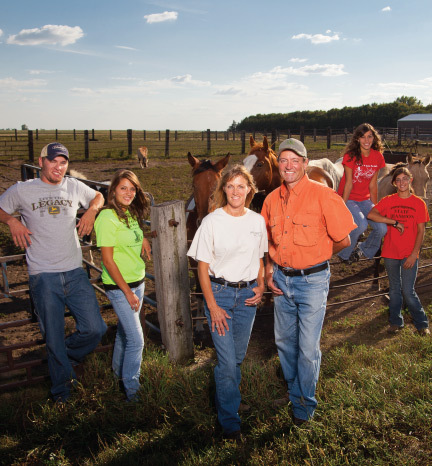 Today, Deb is passing on that work ethic to her kids–Levi 19, Mariah 17, Sasha 15, and Cheyanne, 12. Deb and her husband, Terry, live on a farm just a few miles from Scotland and raise corn, beans and cattle. In addition to crops and cattle, the Roths also raise hobby animals and pets. Steve Lewis, Chief Science Officer at POET Research knows firsthand about Deb’s drive to move ethanol technology forward. Lewis points specifically to their work on the BPX process–a method created by POET that refines ethanol more efficiently by bypassing the long-accepted technique of cooking the corn mash. Today, the BPX process is the cornerstone of POET’s proprietary, patent-pending technologies for ethanol production. The method is now practiced in 25 of POET’s 27 plants. For Jeff Broin, Deb’s hiring was meant to be.